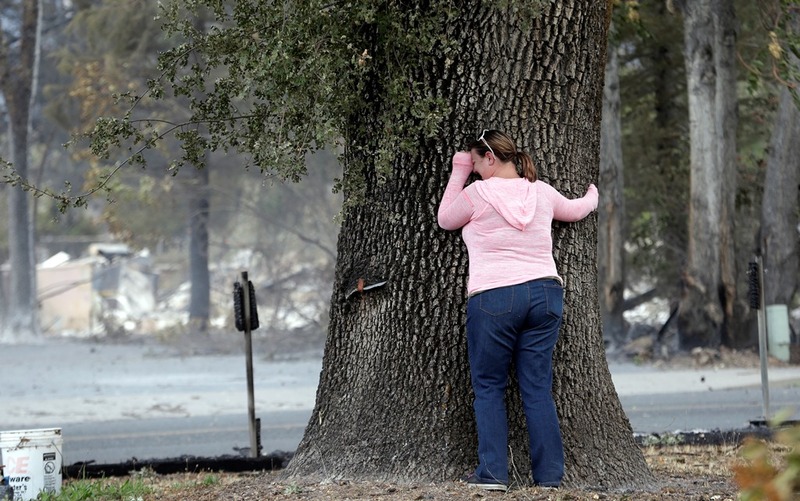 This year’s devastating wildfires provide a peek at the future. With climate change and, now, massive tree deaths caused by the drought, it makes an ugly forecast for future fire seasons. By late October, firefighters in California are usually celebrating coiling the last hose and digging the last containment line. Not this year. The forests are still smoking in the central Sierra Nevada and the state’s northwest corner, where blazes set tragic records for lives claimed and buildings destroyed. And they are smoldering into a new era where drought and climate change are transforming wildfire itself. After four years with little rain or snow in the Sierra, forests throughout the state are tinder dry. Knowing that drought increases fire danger, firefighters have long kept routine daily measurements of fuel moisture to help anticipate fire behavior. But the current drought has unleashed hot and dry conditions unlike any most fire scientists have experienced. They witnessed a summer of fires that morphed into erratic, raging infernos, charging and reversing direction in red-hot furies. That, scientists say, may well spell the future for the state’s parched forests. A U.S. Forest Service assessment in May estimated that nearly 12.5 million trees are already dead, creating a standing fuel source for future ignitions. More recently, an aerial survey using high-tech laser equipment upended that number, estimating the death toll at close to 120 million trees – as much as 20 percent of the state’s total. Greg Asner, a biologist with the Carnegie Institution for Science who conducted the survey, said California’s forests appear poised for a radical transformation. Forest Service scientists are already predicting that, by 2050, the transformation will include a doubling of the acreage burned in the 1970s. Fire seasons nationwide are now 78 days longer than they were four decades ago, according to an August agency report. That is part of a global trend, documented in a 2014 study published in Nature Communications, that found fire seasons lengthened by nearly 20 percent between 1979 and 2013, and burned twice as much land. Matt Jolly, a Forest Service research fire ecologist and the study’s lead author, attributed the changes in fire behavior to human-caused changes in climate. Almost half are due to a greater number of rain-free days on vegetated land, he said. His team also found significant increases in temperature and wind speeds that lengthen fire seasons on all continents except Australia, and in most vegetation types except boreal forests. While most scientists are clear about the effects of climate change on fire, the link between climate change and drought is a little more complicated. To figure out how much anthropogenic warming contributed to California’s drought, Park Williams and a team at Columbia University’s Earth Institute looked at soil moisture data in various parts of the state for every month from 1901 through 2014. Their study, published in August in Geophysical Research Letters,concluded that the lack of rain in California over the past few years has been primarily a function of natural variability, not climate change. But Williams went on to document the most precise estimates so far of how much climate change has contributed to the drought. It’s a fairly consistent amount over the past three years– between 8 and 27 percent of the drought conditions between 2012 and 2014, and between 5 and 18 percent in 2014. The research Williams conducted documents steadily rising temperatures over recent years that chime with other findings predicting a warming trend due to climate change. Temperatures in the Sierra are expected to rise an estimated 36.5 degrees Fahrenheit over the next century, with the snowpack predicted to melt almost a month earlier, according to a study published in Climate Change. Last winter the Sierra was virtually snowless, dramatically compounding the effects of California’s four-year drought. Researchers project a combination of higher temperatures, increased evaporation and reduced precipitation that could, in 70 years, increase burned areas in California by up to 125 percent. This year fit those predictions. The nearly 807,000 acres that burned in California are far above the annual average, said Tolmachoff, the state forestry department spokeswoman. The 9.4 million acres that burned nationwide are 3 million acres more than the annual average for the past 10 years, with “no end in sight,” said Forest Service chief Tom Tidwell. Despite these data, not everyone agrees that fires today are burning more acreage than in the past. Most fire projection studies use a historical baseline spanning several recent decades. That’s too short a period to capture the historic range of fire variability, say the authors of Nature’s Phoenix, a book edited by Dominick DellaSala and Chad Hanson. Between 1950 and 2009, the average annual burned area in California was at least several times lower than the burned area before 1800, they say. Most scientists, however, are convinced that the drought-driven transformation Asner predicts has already begun. The hotter droughts associated with climate change are already causing stress for trees and are likely to grow worse over time, they say. If the trend continues, increased tree mortality will lead to expanded fire seasons. The combination of dead trees and burning forests will release more carbon, contributing to warming in a feedback loop that adds to global carbon accumulations, said Jolly, the Forest Service research fire ecologist.